VPN (Virtual Private Network) - Virtual Private Network. Such a network can also be provided over the Internet and integrate multiple computers. A VPN may have their own additional protection system. This allows the computers on your network more secure, than through the Internet, share files. Usually, VPN networks are well protected. They use encryption and, and authentication, and protection from changes of transferred files. Of course, degree of network security is entirely dependent on the validity of most of the network structure and settings. Additional protection and privacy can provide special programs. Ideally, good protection can provide a complete user anonymity. Through external network combination occurs all internal. To create an internal network does not necessarily, to computers, its constituent, They were directly connected. Computer can connect through the external network and. for example, you can connect to the network computer, which is on the other side of the ocean. For this special VPN server must be configured, which must be connected to both networks, both internal, and external. To connect to a VPN, you need to perform several actions. It is necessary to undergo a process of user identification and authentication, after which you can log in. Authorization provides full access to the computer network capabilities. The main advantage of VPN is the ability to create a private virtual network, computers which can be placed far apart and not interconnected directly. 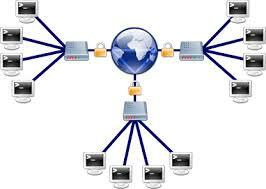 Moreover, the network will use all the features of a conventional LAN. That is, you can link to a private network of computers, scattered in different parts of the world. Of course, each of these computers must have access to the Internet.